This is a Monk Fish. Maybe this Monk Fish was a highly regarded Monk Fish within the Monk Fish Community. Maybe he was the life of Monk Fish parties and gatherings. Maybe he had a Girlfriend AND wife. Maybe he was friends with some pretty rich Monk Fish and he always managed to be seen and photographed at important Monk Fish Events. I think it’s also possible this Monk Fish thought of himself as a clever and slick Monk Fish kind of Guy. I’m just pulling your fin ( Yes fin, not finger. I’m staying on the fish topic here). The reality is I am not sure about any of these things. But I know a couple of things for certain. This Monk Fish ended up on ice attached to a wire that a fish Monger pulled to make the Monk fish move and I took a picture of it and laughed. That’s the thing about our lives and the Monk Fish’s ultimate fate. Sometimes we move through our lives because it’s our life to move through and we decide where live and what to wear and what to eat. We are in charge of our own lives by Jove! Nobody is the Boss of me! And sometimes in our very next breath we end up on ice attached to a chain that anyone can pull at any time they want just for the Hell of it. It would be great to know if anyone is in charge here, but really would it matter? That table with the ice and the chain is always there- if not in the fish market then it’s in a boardroom or classroom or Grandma’s Dining Room and I don’t think it cares who is on top of it. 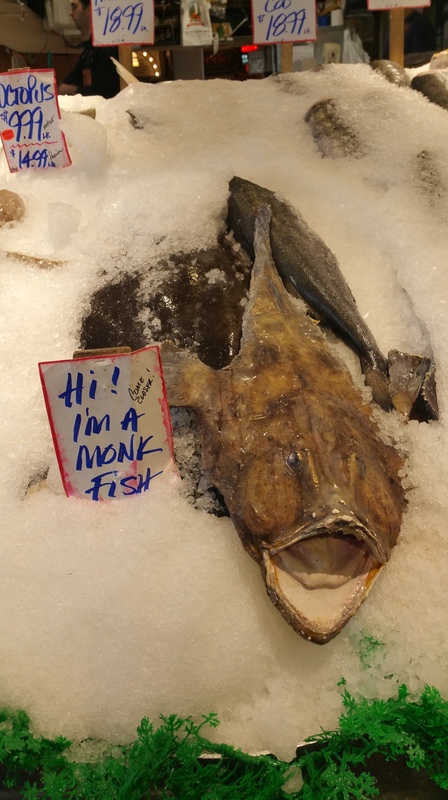 And no matter what kind of life I think the Monk Fish had- and like I said I could be totally wrong about the specifics, I think we all have more in common with Mr Monk Fish then we’d like to admit. The Monk Fish… I had to google! He is quite character to be around! I do have more in common with him than I would like to admit! Enjoyed!!! Thanks for participating in Daily Addictions. Thank you! I’m having a lot of fun at Daily Addictions! The Monk Fish is quite a creature, especially when it “talks”. I did not read about ‘talking”!! !